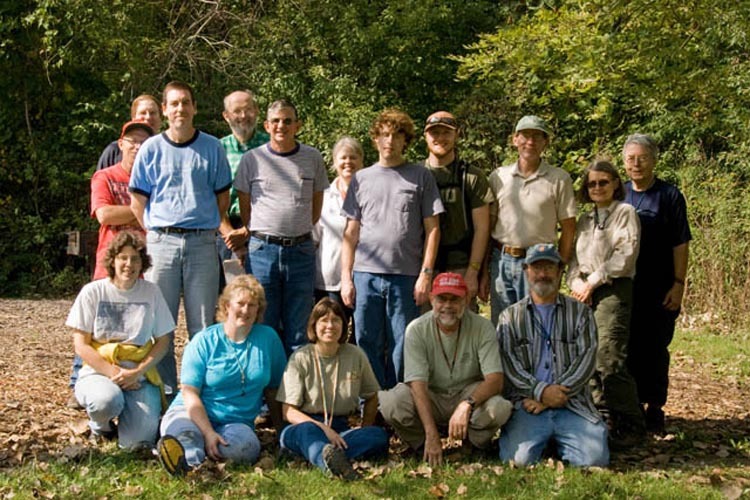 The fall 2008 foray of the Ohio Moss and Lichen Association was organized by Diane Lucas and conducted at two separate preserves in Erie County, Ohio: Edison Woods (September 27th) and Castalia Quarry (September 28th). The foray was attended by 20 people, including several from surrounding states. OMLA Castalia Quarry Reserve, Erie County, Ohio. September 28, 2008. On the first day we spent the morning and early afternoon exploring Edison Woods Preserve. This 1300 acre park was once slated to become a nuclear power plant, but has been protected by the Erie County Metro Parks as an important ecological area, consisting of sandstone cliffs, woods, meadows, and wetlands. 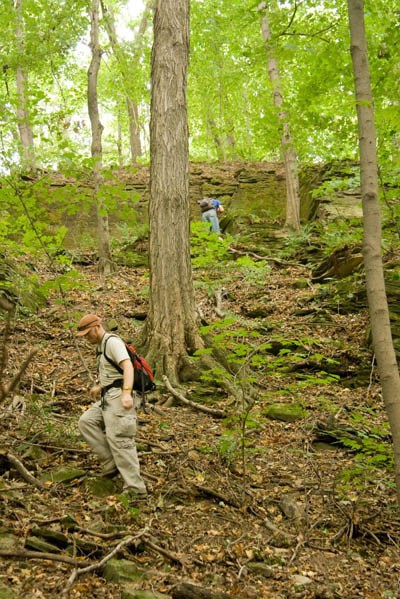 John and Dave explore steep woods and sandstone cliffs. Edison Woods Preserve in Erie County, Ohio. In the evening of the 27th, a microscope room was set up to identify specimens collected during the day. A total of 41 bryophyte species were recorded from Edison Woods, including a new Erie County record, Tortella mucronifolia. 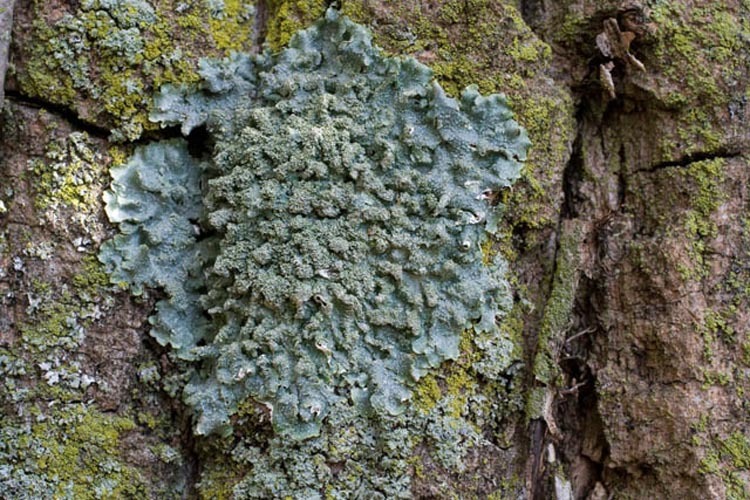 An additional 21 species of lichens were recorded, 12 of which were county records. 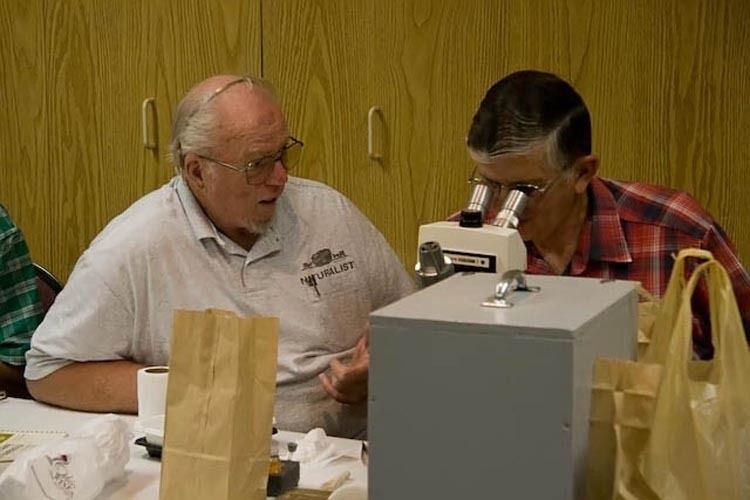 Ray and Don ponder a lichen specimen collected during the afternoon at Edison Woods Preserve. 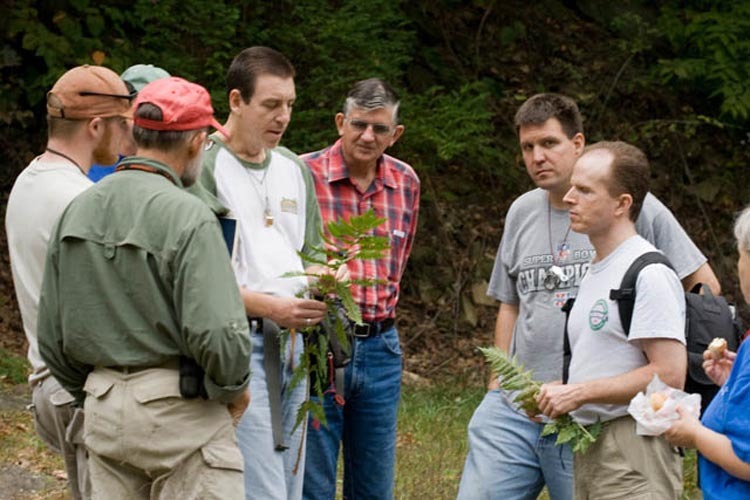 Brian discusses an interesting vascular plant at Edison Woods – the rare Goldie’s Fern. The second day of the foray was spent at Castalia Quarry. This quarry began operation on the early 1870’s and the limestone collected from the site was used as Lake Erie shoreline walls and general building purposes. Operations ceased in 1929 with the advent of the Great Depression. Twenty-five years later, the quarry was re-opened to supply stone for the construction of the Ohio Turnpike, which was completed in the mid-1960’s. From that time, the quarry has remained undisturbed and is slowly returning to its natural state. Since 1987, the area has been protected as an Erie County Metro Park. Panoramic view of Castalia Quarry, taken from the southern rim trail. Note barren and scarred landscape left when quarrying operations ceased in the 1960’s. Surprisingly few lichens were encountered on the exposed rock areas, indicating the very slow rate of recovery for this sensitive group of plants. Most of the species reported occur on tree bark, with only two found on soil (Cladonia macilenta and Collema tenax). A total of 25 lichen species were recorded from the site, including two new Erie County records. Foliose lichen Punctelia rudecta on tree trunk in Castalia Quarry Reserve, Erie County, Ohio. 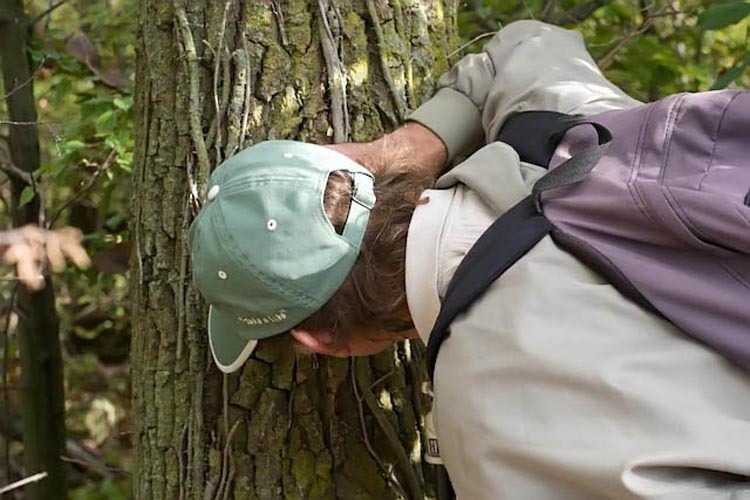 Dave gets up close and personal with a lichen gracing the trunk of a tree at Castalia Quarry. 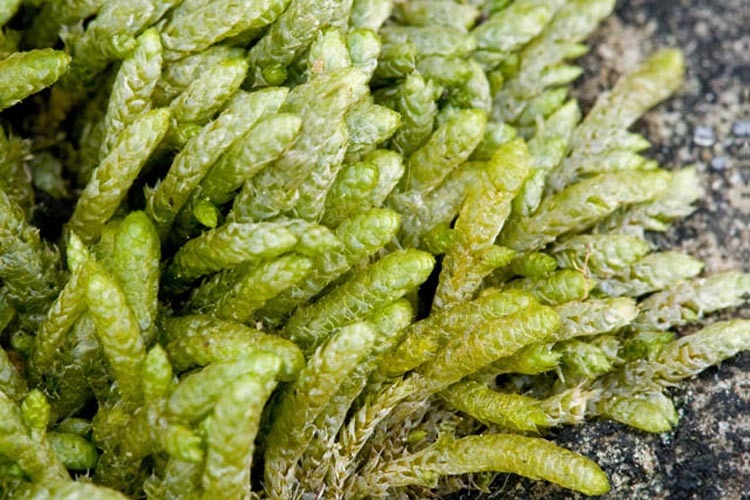 In contrast to the relative paucity of lichen species, bryophytes appear to have adapted to the new environment fairly well. A total of 39 species were recorded, including 4 new records for Erie County. Close-up of Bryoandersonia illecebra taken at Castalia Quarry Reserve, Erie County, Ohio. For a full list of all moss and lichen species recorded from this two-day foray, please check out the most recent issue of the Obelisk. Descriptions of future forays can also be viewed on the OMLA website’s Upcoming Forays page.